NEW DESIGN! Love this sign for the winter season! Hand Painted snowman with stars above his head. 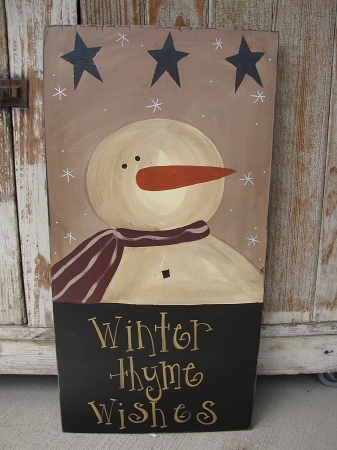 The bottom portion has been painted black and the saying shown is Winter Thyme Wishes. There are options to choose from below. The snowman has been hand painted on with a burgundy scarf. Choices are available for the scarf color. Three stars painted along the top and he's surrounded by snowflakes falling! Size is 22"x12". Sawtooth hanger shown, other options available. Hand painted, designed and signed by Heidi.